An Unexpected Party – Chat with PJ and GDT! Los Angeles (Pacific) – Saturday, 24 May 1:00 p.m.
New York (Eastern) – Saturday, 24 May 4:00 p.m.
London – Saturday, 24 May 9:00 p.m.
Paris, Berlin, Rome – Saturday, 24 May 10:00 p.m.
Sydney – Sunday, 25 May 6:00 a.m.
Several years ago – it seems a lifetime now – I invited 20 questions from fans right at the start of embarking on The Lord of the Rings trilogy. For me, it was an important and enjoyable moment, when I was able to begin a relationship that helped define our attitude to that unique project. It gave me a sense of responsibility that stayed etched in my brain for the next 5 years. 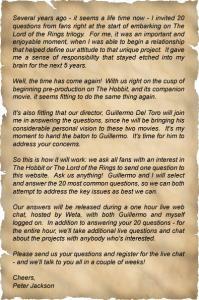 Our answers will be released during a one hour live web chat, hosted by Weta, with both Guillermo and myself logged on. In addition to answering your 20 questions – for the entire hour, we’ll take additional live questions and chat about the projects with anybody who’s interested. Please send us your questions and Register for the live chat – and we’ll talk to you in a couple of weeks.